Vikki Jackson has worked as a wetland ecologist for over twenty five years. She received a Masters of Science in Biology from Western Washington University with thesis work on peatland ecology. Her work with wetlands has led to an interest (some would say obsession) with amphibians. Vikki has been involved in amphibian projects in Western Washington including as the project lead for a citizen science project for amphibian documentation within the Chuckanut Mountains and as a project coordinator for another citizen science based amphibian survey on BP lands in Ferndale, WA. Most recently she has served as the program manager for the Whatcom County Amphibian Monitoring Program (WCAMP) since 2013. 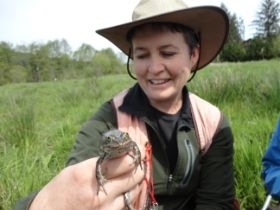 Her work with WCAMP has included research and documentation of habitat use and census work on Oregon Spotted Frog in Whatcom County since 2011. Stephen Nyman has been studying and observing amphibians for more than 35 years, beginning on the East Coast, mostly in New Jersey, Rhode Island, and New York. He has a Masters degree in Ecology from Rutgers University and a PhD in Biological Sciences from the University of Rhode Island. His research interests have included the distribution and larval ecology of co-occurring, pond-breeding salamanders (Ambystoma species); the role that larval amphibians play—as consumers of algae and invertebrates—in structuring communities within temporary ponds; cannibalism in larval salamanders; ecology and behavior in a population of Cascade torrent salamander (Rhyacotriton cascadae); and since 2013 has been formulating research questions regarding Oregon spotted frog (Rana pretiosa). Stephen has lived in Bellingham since 1989, from which he has had the great pleasure to do field work in eastern and western Washington, Oregon, California, and Colorado, and become familiar with a wide variety of species in diverse environments. He conducts specialized studies of amphibians, including surveys and habitat assessments for federal and state-listed species. He is also an avid amateur photographer, and is keenly interested in the conservation of amphibians and preservation of natural places. Monique in her element, outside and in the mud! Erin has been a volunteer with WCAMP since the spring of 2015. 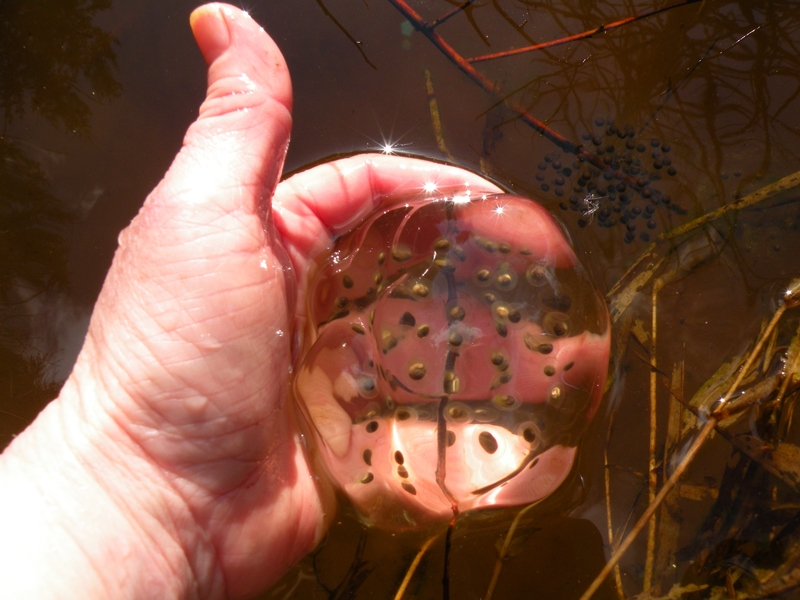 She has participated in several egg mass surveys and, more recently, she has helped to improve the Oregon spotted frog habitat along the Samish River. Erin graduated from Huxley College in 2014 with a degree in Environmental Science with an emphasis on freshwater ecology. She is looking forward to working with WCAMP and learning as much as she can about amphibians! We want to thank Esther for all her hard work she did this year in the WCAMP program. Esther was our 2016 intern. She has hopped away for a job in the midwest working on a water quality program. Esther is a powerhouse of energy and managed to get our program well on the way to having a well developed GIS program for mapping and database management. She set up and managed our fledgling Bullfrog/Greenfrog survey program. She also wrote some great postings on our Facebook page and worked hard in the field with Stephen Nyman on the Oregon Spotted Frog. We will miss her friendly face and amazing focus, but we wish her the best of luck in her new adventures. Thank you, Esther.